Again, very strong correlation sith SPY. Volatile environment. Despite Friday's strong up move, there is no change in our analysis: Contrary to lower time frames, the daily chart still points downward, and this is by far the dominant time frame. 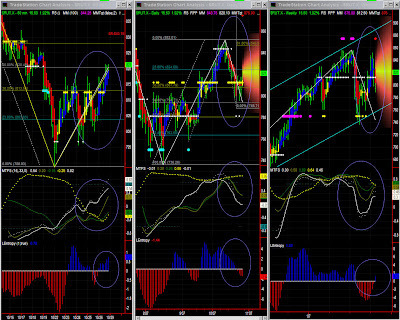 Caution must be exercised, until Fib and MM give us indication of support. Until then: trading range with a downward bias. Support on Fib and MM levels (cf chart) seems to hold though, so one must follow the formation of a Fib pattern accordingly. Entropy is looking good, but MTFS indicates continuation of this situation of congestion with a very slight upward bias. The bar has turned red. Note: Swings are back UP, but this indicates we are close to a key level. 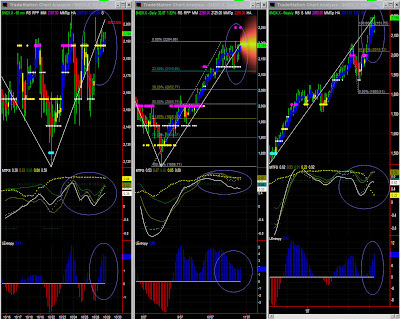 Thursday's Down indication could very well be a warning, as the Swing indicator is very reactive. The market is so overbought that a correction would be healthy, yet one should avoid any wishful thinking as it is not visible on the charts just yet. The market is both resilient and very volatile. Lower time frames seem to point slightly upward in the same trading range. We reached the high end of that range, which is also bumping on 'stall' level. Since there is still an upward bias, we'll have to watch this level carefully. If this level is passed, NDX will obviously aim for 2250. Daily: Congestion to Up. 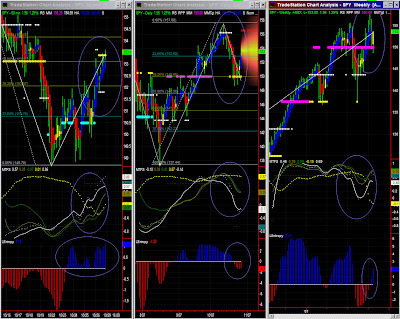 Slow down in overbought territory.NDX is overbought, and each retracement so far has failed. Entropy and MTFS are holding very well, so one may just try and reach 2250 (or stay at prior stall level around current highs). Market direction: Probably up if support is confirmed. Daily: Congestion to down. Check levels carefully. Contrary to lower time frames, the daily chart still points downward but also seems to acknowledge the 150 support level. The MTFS pattern is however not bullish, nor is Entropy. There is therefore no reason yet to believe it will go much higher. Entropy is looking OK, but MTFS indicates continuation of this situation of congestion with an upward bias.